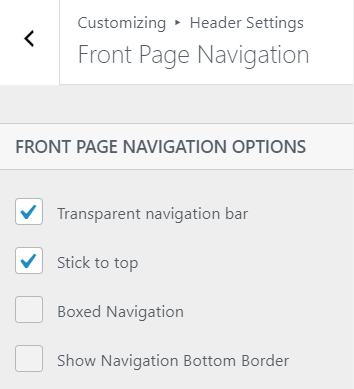 You access this section from Header Settings -> Front Page Navigation. Further, you have multiple options to customize navigation. Front Page Navigation refers to how a user navigates throughout the page, directly from the menu and within the contents of the website. Transparent Navigation Bar: this option allows for full transparency of the navigation bar. If you uncheck the checkbox, you will have to set the navigation bar color (details hereafter). Stick to Top: this option refers to a navigation bar that sticks to top as the user scrolls down the page. If you leave the checkbox unchecked, the navigation bar and menu will not appear when scrolling down the home page. Boxed Navigation: check this to make the navigation bar the same size as other elements; by default, the navigation bar is wider. Show Navigation Bottom Border: check this to enable a thick border under the navigation bar. Navigation Bar Color – by clicking Select Color, you have the possibility to choose the background color of the navigation bar. This is perfectly suited for a website owner that wants to match the colors to the branding style they opt for. This section applies modifiers to the menu items, from color to font style. 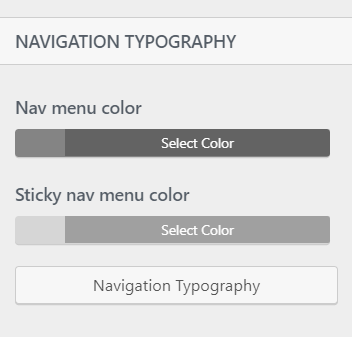 Navigation Menu Color – Here, you can select the color of the items in the menu bar. Sticky Navigation Menu Color –The color you choose here will be applied to menu items when in scrolling mode. This section applies to the customization of the submenu items. In case you choose a text logo, and not an image one, this section is for you. You can customize the text logo in the navigation bar, as you wish. Text Logo Color – select from a wide range of colors the one that best suits the logo of your newly created website. You may want to choose a darker color, if the logo is placed on a light-colored background. Sticky Navigation Text Logo Color – select the color you want for the text logo, when in scrolling mode, when the navigation bar is set to sticky. Text Logo Typography – by clicking on this button, a panel with different typography options will open. Adjust the font, letter spacing and capitalization according to your preferences.